For the conclusion of my comparison between the Attitude Era and the current PG rating WWE aims for, I’m going to list some of the reasons I dislike the Attitude Era and why I don’t think it was as great as most people seem to remember. I’m not going to deny the popularity of the Attitude Era or the stars that rose to fame during that time. Similar to how country music became popular due to the success of Urban Cowboy, and then quickly faded back into the background of pop culture, I think the Attitude Era happened to all the stars being aligned perfectly for a short period of time and then when wrestling became passé the majority of the new “fans” moved on to the next cool thing. The Attitude Era didn’t create wrestling fans. An analogy might be made that the Attitude Era is similar to the grunge or even boy band phase of popular music. A fad that connects with a lot of people for a short period of time until something new comes along. I’m not saying there aren’t any fans who started watching during the Attitude Era still around. I am willing to bet though the percentage of fans that became true wrestling fans during this time is pretty low. I should also clarify in my opinion there is a difference between wrestling fans and WWE fans. Wrestling fans have the sickness and will seek out and watch any wrestling they can find. WWE fans feel if a guy isn’t on the WWE roster the wrestler obviously isn’t any good and only WWE is worth watching because all the other wrestling shows take place in smaller venues in front of a handful of fans. Now that I’ve stepped fully onto my soapbox, getting back to the subject at hand, the first two examples of why the Attitude Era wasn’t great are the Royal Rumble and Wrestlemania. “Stone Cold” Steve Austin won the Royal Rumble in 1997, 1998 and 2001. 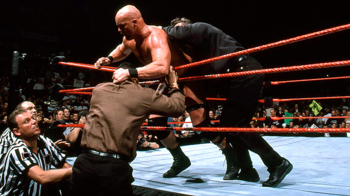 In 1999, Austin was the last man eliminated by winner Vince McMahon. Austin did not compete in the 2000 Royal Rumble due to being out of action with an injury. The 1997 victory wasn’t originally supposed to happen. Vince Russo, then known as WWF Magazine writer Vic Venom, appeared on the live WWF Saturday morning program Livewire and said the Shawn Michaels would regain the WWF title and Bret Hart would win the Rumble to set up a Wrestlemania rematch. 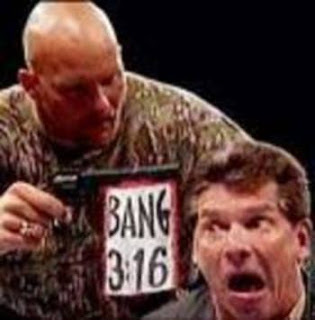 Vince McMahon then asked Russo why he gave away the results on live TV. Russo, who wasn’t part of the creative team, said he didn’t know the results but that was the predictable outcome. Plans were then changed to give Austin the victory and postpone Bret getting a title shot at Wrestlemania by setting up the main event for the February Pay Per View in a four-way match between the last four men in the Rumble. Even though 1997 is a year before the Attitude Era really began, I’ve included it here for the point I’m getting around to making. Even though Austin didn’t win the 1999 Royal Rumble, the match was all built around his feud with Mr. McMahon. Austin and McMahon started the Rumble as numbers one and two. Going off of memory here, after brawling for a few minutes, Vince tried to get away from Austin by running all over the arena. While they were fighting outside the ring, the ring filled up with mid-card acts that everyone knew didn’t have a chance of winning. During this time, the cameras kept cutting back to Austin and McMahon thus making the Rumble match seem unimportant. Finally after they returned to the ring towards the end of the match, there were several main event talents in the match. The match eventually ended, I believe, when the Rock’s music hit distracting Austin long enough for Vince to toss Austin over the top rope and earning a shot at the WWF title at Wrestlemania. Vince would go on to lose his title opportunity to Austin at February’s St. Valentine’s Day Massacre Pay Per View. Essentially, during the Attitude Era, the Royal Rumble only had one winner. Royal Rumble 2000 is the anomaly due to Austin’s injury. Who knows if Austin would have been champion going into the Rumble or if he’d be trying to earn another main even spot at Wrestlemania had he been healthy. Speaking of Wrestlemania, the main events during the Attitude Era shine another light of the flaws of the Attitude Era. I’m going to first say I think Wrestlemania should be the culmination of storylines. Wrestlemania should be the previous year’s climax. Maybe I still have an old school mentality and treat Wrestlemania the way I did when there were only four Pay Per Views, but I truly believe Wrestlemania should be something special. For that reason, I was irritated when Undertaker and Shawn Michaels fought on two consecutive Manias, and really don’t want to see ‘Taker and Triple H fight again this year. Look at the main events from Wrestlemania during the Attitude Era; Wrestlemania 14: Shawn Michaels vs. Steve Austin. Wrestlemania 15: Rock vs. Steve Austin. Wrestlemania 2000 (16): Rock vs. Big Show vs. Triple H vs. Mick Foley. Wrestlemania 17: Rock vs. Steve Austin. Again, Austin was injured during 1999-2000 so he missed Wrestlemania 16. I was going to include Wrestlemania 19 as that also had Austin/Rock, but I figure that could be seen as more of an ending to the Attitude Era so it made sense for the two biggest stars of that time to fight each other. Even though it was the third Wrestlemania match between them. The point I’m trying to get to is the Attitude Era was built around Steve Austin and while there were some other side players (HHH, Foley, Rock) the majority of the attention was given to Austin. I have two critiques about that. The first is even though Austin was seriously injured prior to becoming world champion, WWE rode him as long as he could go without an eye for the future when Austin would be done wrestling. It didn’t help them with The Rock becoming an in demand actor and retiring from wrestling sooner than anyone would have expected. Mick Foley “retiring” in 2000 also took away a main even star. Again, not saying there weren’t other stars or guys ready to step up. And I won’t deny the popularity of Austin or say he didn’t deserve the top spot. I will say, given the number of characters that became popular during the Attitude Era, WWF did a poor job of elevating talent and establishing several main event talents. Flash forward to 2012. John Cena has been the face of WWE for seven-eight years. John Cena has been in the main event of seven Wrestlemanias. The only opponent he’s faced more than once is Triple H, once in a one on one match and once in a triple threat match along with Randy Orton. During the time Cena has been on top, there have been no repeat Royal Rumble winners. While there is still a problem of “stop and go” pushes with some of the younger talent, WWE has at least tried to put more than 2 or 3 guys in the main event picture over the past few years. Sure there are some flaws in my comparisons. WWE has two brands now instead of one as they did during Austin’s heyday. That leads to more wrestlers getting airtime. I’m sure people will also say “Stone Cold” was a better character than John Cena therefore the Attitude Era was better. Well, I guess that is just a matter of personal taste. I could also include how the Attitude Era led to the trend of short title reigns, crash TV and hotshotting matches and angles for the sake of ratings. Most of the things people complain about in the current wrestling landscape, besides the PG mindset, have their roots in the Attitude Era. Guess this is another prime opportunity to mention if you think PG is the reason why WWE isn’t good, go watch AAPW or Chikara and you’ll see that all PG means is the show will be fun the entire family, not just a small section of the crowd. Thoughts? Comments? Share them with us on our Facebook page. Good กV I should certainly pronounce, impressed with your web site. I had no trouble navigating through all tabs and related info ended up being truly simple to do to access. I recently found what I hoped for before you know it in the least. Reasonably unusual. Is likely to appreciate it for those who add forums or something, website theme . a tones way for your client to communicate. Excellent task..